3. Add oil to a pan over medium heat. Add garlic and onion, cook until brown. 6. Finally add all ingredients together in large serving bowl: Pumpkin, cous cous, chicken, cooked veggies, feta, fresh mint, apricots and Danish feta. Mix and season with pepper. Nutrition – Did you know? From our team “Where ocean meets the land”, the winners of our last Corporate Workshop Challenge. Slice mushrooms and zucchini and grill in a medium-hot pan for 3-5 minutes. Add to salad once cooked. 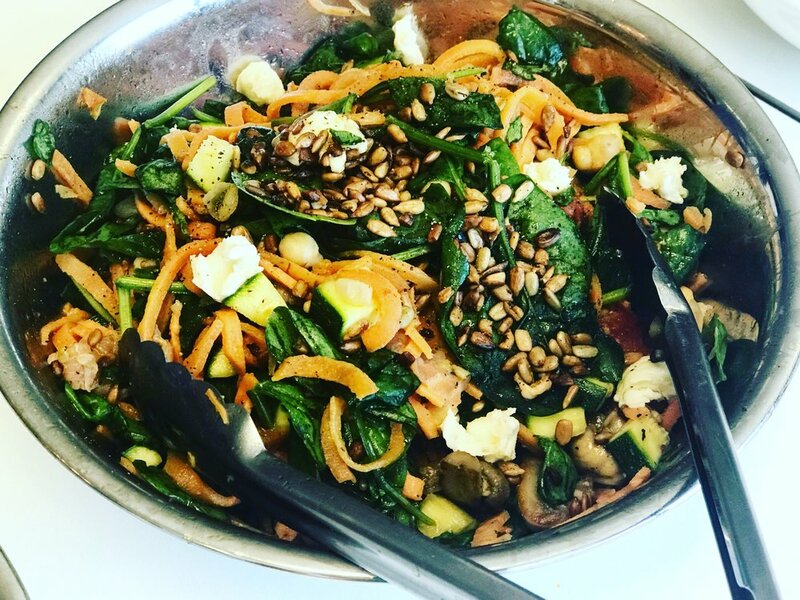 Add the roasted sunflower seeds (save some for garnish) and mix the salad through with a drizzle of olive oil and cracked pepper for taste and enjoy! 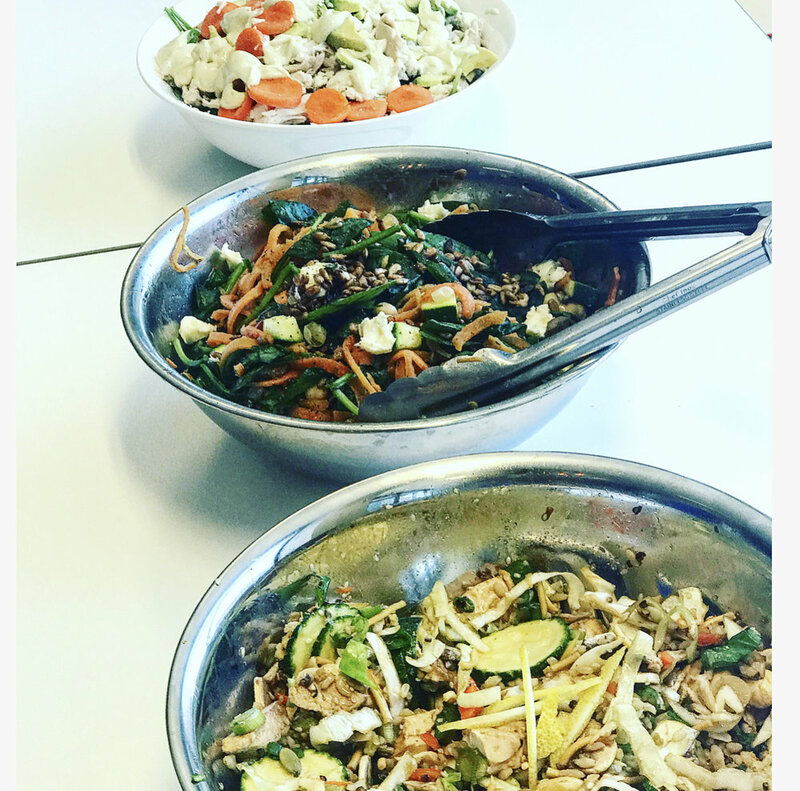 The name & creation of this recipe was inspired by the winning team at Workday who took part in one of our fun and interactive cooking classes - creating lunch salads that are nutritious & delicious, keeping energy high until the afternoon! 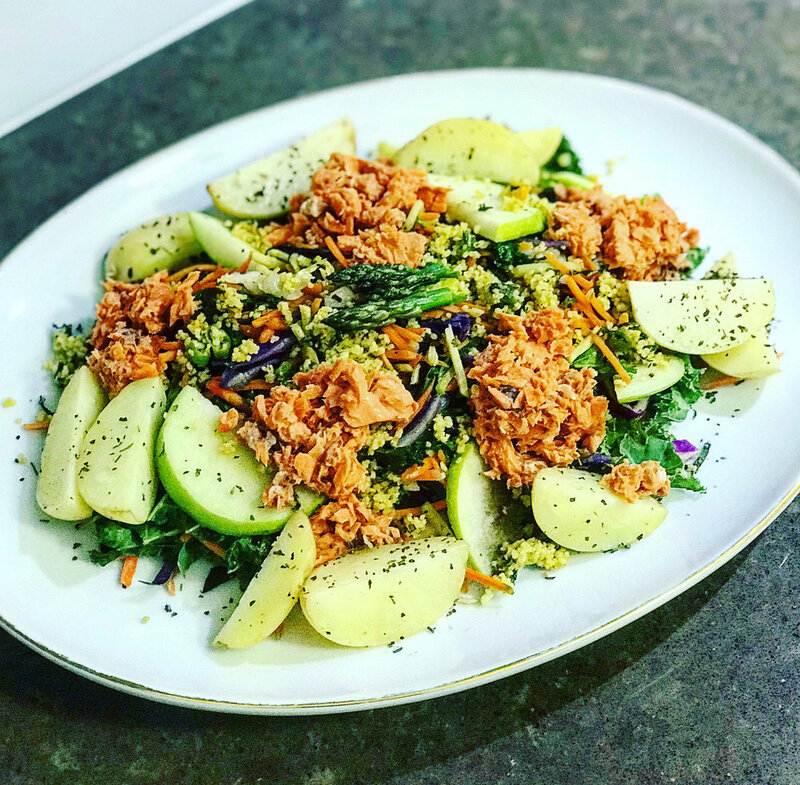 Searching for a quick, nutritious and tasty salad to go with your Christmas dishes!? Preheat oven to 180 degrees. Spray 12 medium muffin pans with oil to grease. Literally throw all ingredients into a big bowl whilst dancing to Michael Jackson and combine well. Spoon the mixture into prepared tins and bake in the pre-heated oven for 20 minutes until golden and cooked through. Transfer to a wire rack to cool. As a lighter snack have one of these with a cup of tea. For a bit more protein eat your muffin with a 250mL cup of coffee, glass of milk or chai for a snack worth about 220-250 calories/924-1050kJ kilojoules. Suggestions: Heat in the microwave, especially during these cooler winter months! Blend all in a food processor or blender. 1. As a snack with cut up veggie sticks or grainy crackers. 1/3 of a cup is a good portion! Carrots are high in Beta Carotene, an important antioxidant which plays a role in generating healthy skin and eyes. Tahini is made of sesame seeds and high in a certain natural food chemicals called lignans which have been seen to reduce cholesterol. Tahini is also a good source of calcium and magnesium, which aids in building strong bones. Ginger has been seen to reduce inflammation, assist in protective immunity and assist with digestion. What are you waiting for - eat it up! A healthy twist on a family classic that everyone will enjoy! 2. Boil 1L water and steam sweet potato and pumpkin until soft (about 10–15 minutes). 3. Transfer to a bowl, add 1 tbls oil & mash. Set aside. 4. Add remaining oil to a large saucepan placed over medium-high heat. Add onion, curry powder and turmeric. Cook for 3–4 minutes, until soft. Add bay leaf and mince; cook until just browned. 5. Stir through beans, carrots, broccoli, zucchini and cauliflower. Cook until soft for approx 5 minutes. 6. Add tinned tomatoes, turn up the pan and bring to a simmer (small bubbles). 7. Stir through lentils and simmer for 15 minutes. 8. Transfer mixture to a large casserole dish and top with mash. Place into preheated oven and bake for 40 minutes. *Recipe adapted from the Australian Healthy Food Guide. Katrina is an enthusiastic and driven dietitian with a client-centered approach to nutrition and health. She understands the positive effects nutrition has on the ability to assist in recovery, ease symptoms and improve overall quality of life. I've always been a big supporter of the Mediterranean diet and its inclusion of fish. Fish contains Omega 3's important for maintaining healthy cholesterol levels. It also helps reduce inflammation in the body (inflammation can lead to increased risk of chronic disease and other health problems). Try and include a fresh fish meal at least once in your week. It mixed things up anyway and tastes delicious if infused with some herbs! Sounds naughty but tastes delicious! The best way to go about a healthy eating plan is to enjoy new ways to nourish your body. Last week I found myself at home with limited ingredients yet wanting to be creative! This is what I was able to rustle up in a matter of minutes and it turned out delicious. Choose one or the other, both good! 1. Heat up onion and garlic over medium heat in saucepan. 2. Add in meat and brown. As well as being Australian I am a proud Austrian citizen with a father named Wolfgang and a heritage of growing up with the popular veal/chicken schnitzel at Oma and Opa’s place as a child. Hence the other day when reading over an extremely diligent client’s food diary I almost jumped in excitement when I saw quinoa schnitzel recorded! What a great way to make this staple and loved dish healthier. Quinoa being low GI was a great alternative to the typical breadcrumb experience. From there I also had another great client who mentioned instead of dipping the chicken in egg and milk mixture she used low fat greek yoghurt instead and it tasted delicious! So here we go. Inspired by the people who make my day enjoyable, satisfying and a positive journey towards healthier living. Thank you. 10. Serve with Steamed or baked veggies or a scrumptious salad!